1+1 HDMI inputs. Switch selector. H.264 or H.265 Encoder, RE-MUXER, and DIGITAL MODULATOR. DVB-T, or DVB-C RF, IP MPTS, and ASI outputs. HDMI 1 x HDMI 2.0 INPUT + 1 HDMI 2.0 INPUT (Back-up). 1 HDMI loop output. 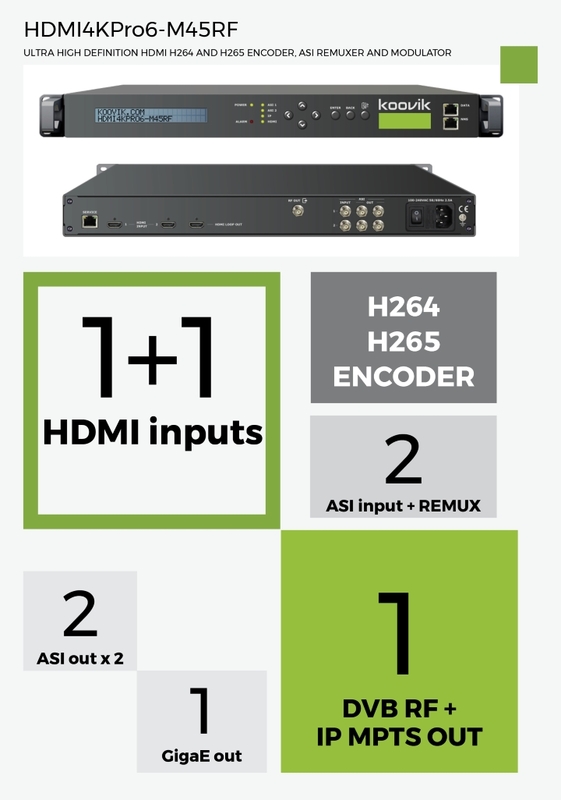 VIDEO CODEC H.264AVC and H265 HEVC. BIT-RATE 2 Mbps to 29 Mbps Constant Bit Rate. multiplexer 2xASI + 32 x IP STREAMS multiplexed with HDMI TS. PID filtering and remapping. PSI/SI table edition. IP MPTS 1 MPTS over UDP or RTP/RTSP. Unicast or Multicast. ASI 1 x ASI ( 4 mirrored ASI outputs ). BNC 75 Ω female. SET-UP Local : Front panel LCD display and keyboard. Network Management Setup - NMS : Embedded web server (English). included 1 x mains cable, 1 x ground cable, 2 x HDMI to HDMI cables. 2 x BNC male to BNC male.